When Bill and Turner Ross first arrived in Eagle Pass, Texas, they had no idea how long they were going to stay for. Bill, arriving from New Orleans, had packed for just a week-long excursion with his brother, who was making his way down from his home in New Mexico. But when the two spotted a glorious banana yellow 1977 El Camino across the street from their motel with a handwritten “for sale” sign in the window, they knew they might be sticking around for a while. Fittingly, the car would also tell them the time to leave, dying just days after they wrapped filming on their third feature “Western,” which like its predecessors, the Ohio-set “45365” and “Tchoupitoulas,” unfolding over the course of an evening in the Big Easy, perfectly captures a specific time and place. Full of the epic sweep of the genre it suggests in the title, “Western” is at once timeless yet utterly contemporary, capturing in intimate detail the struggle of life on the U.S.-Mexico border where a well-intentioned effort to cross-pollinate communities is complicated by the ever-looming threat of drug cartels. 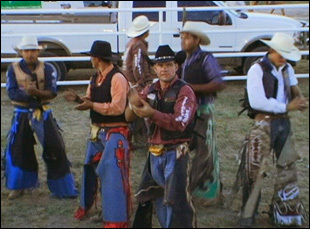 Although the Ross brothers take in their surroundings as a whole, they find central characters in Chad Foster, the mayor of Eagle Pass who in the right light can seem as if he walked out of a John Wayne movie, given his sense of civility and decorum, and Martin Wall, a cattle rancher whose business suddenly flails when he can no longer cross the border to trade livestock. 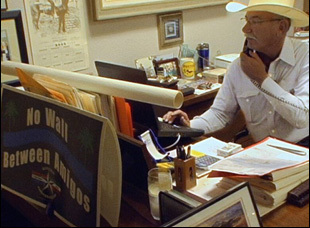 Although Eagle Pass and its sister city Piedras Negras may appear to be towns that time forgot, the filmmakers vividly display just how alive they are — the mechanics of farming life always churning, the residents making their own fun, whether with fireworks displays or ruminating about local politics at the coffee shop, or combating the gathering storm clouds that forecast the unrelenting scourge of the drug trade. It’s a film that’s every bit as evocative as the Ross brothers’ previous film, but also suggests a further sharpening of their skill and on the eve of the film’s release in New York at the IFC Center this Friday and a special screening in Los Angeles at Cinefamily on September 23rd, they spoke about how “Western” fits into their filmography, the influence of Cormac McCarthy and creating a constant sense of revelation in making the film. After “Tchoupitoulas” and “45365,” you’ve described these three films as a trilogy. How did “Western” become the third piece? Turner Ross: It has its own unique story just like all of them do and what we make is a reflection of how we’re feeling and what we’re doing at the moment. We were shooting “Tchoupitoulas” and the opportunity arose for us to go do something new. We [thought about] regional Americana, the things that really stick with us in some nostalgic way [and asked] what is the other part of that? It was this very mythic place that has been a part of our lives and everybody’s vernacular, and it really drew us back to memories of watching B-westerns with our dad when we were young kids in a rerun theater in Harrisburg, Mississippi, falling in love with the landscapes and those big-chested folks [in the movies]. We wanted to know what that actually looked like. If we’re going to focus on making movies out of our private past and reality, then what would a western be like? How could we actually confront that genre and also stick true to what we believe in, which is this experiential thing that’s part of our lives? That’s what started the ball rolling really, [the idea] to make a non-fictional Western. How did you find Eagle Pass? Turner Ross: We did a scout along the Rio Grande and New Mexico, staying on either side of the border, going to each town and just getting a lay of the land. We had a preconceived idea of what that iconic landscape might look like and scouted all of those towns. Some were too big, some were too small, some were too violent, and some were too this or that. Eagle Pass was a place that I found that I thought, “This is exactly not what we’re looking for,” but as I drove away I realized that was my idea of a place talking rather than what the reality is. The reality is that Eagle Pass and Piedras Negras are the quintessential border towns. They’re symbiotic communities that have been together as long as people have been living in that part of the world and it’s not so much Texas and Mexico, it’s this cultural region. Thinking about that and continuing to dig in, I found some writings about Chet Foster who was the mayor at that time. The year before, he had sued the federal government to prevent a wall going up between the towns and [I thought], “Wow, this is a place that cares about its heritage and relations with each other, so you know we’ll see these people interact.” I just reached out to him and told him what we were after and he said, “Well, just come on down.” We did for a couple days and started filming that same day and didn’t leave for 13 months. How did Martin Wall come into the picture? Bill Ross: I was in the middle of editing “Tchoupitoulas” and Turner said, “Let’s go to Eagle Pass,” so I just packed a backpack to go on a weeklong trip, and it was on that first day that I got there that Chad took us out to Martin’s ranch. We got there and Martin looked at us a little funny. We didn’t look the part and definitely stuck out. He offered us a beer and they were a little standoffish to begin with [because] we were long-haired guys that they weren’t quite accustomed to, but they just kept letting us hang out and we just kept shooting. Eventually, we became very, very great friends. Was it obvious these two towns were so interconnected that you knew to go to Piedras Negras after being in Eagle Pass or was it as the shoot wore on, you thought to yourself, “We ought to go down to Piedras Negras”? Turner Ross: There’s not this great divide. It’s like it’s one region, one people, and this tale of two cities looking across the border from each other was just so vastly intriguing, but it was approached the same way that we always approach everything — to go into a place and just cast a very broad net. We did that, filming with people on both sides and eventually gravitated towards Chad and Martin, though we have dozens of characters on both sides. We were starting to film with the mayor of Piedras Negras before he passed away and because we’re filming in nonfiction, you can only present what you can capture, so what we captured that best conveyed the story was with Martin and Chad. There was this constantly revelatory style throughout the film regarding how you’d introduce new characters or scenes, from that very start when you’re shooting Chad Foster from behind and you gradually reveal who he is or the aural transition from the gunshots to the fireworks at the end. Since those are things that feel like you might have to plan for, did you have certain ideas about how you’d approach that going in? Turner Ross: It’s what we’re after because of the adventurous experiential aspect of what the production is. We had just come from New Orleans where everything was late at night and loose, [feeling like] this swirling kaleidoscope, and then we ended up in the arid desert. It felt like it needed to be wide, stark and iconic and framed in a certain vernacular. Part of that is an aesthetic set-up with the concern of what these images look like playing it back and how people perceive these things versus how they experience real life. But then it’s also just being invested in a place so much that it starts to speak to you in that way. If we’re present enough — if we’re not fly-in, fly-out filmmakers — then the place becomes you and you become the place, so when you’re speaking that language visually, it becomes a subconscious thing. At least, that’s our hope. That’s a great joy after a while to find in the footage that it speaks the language of the time and place. This may be inaccurate, but it seemed like every section had a different instrument for the base of the score. How did that come about? Turner Ross: Yeah, this is our 2nd time working with Casey McAllister, a musician that lives in my neighborhood in New Orleans, and it’s a wonderful thing. These last two times, we’ve gone down to the local bar and I tell him the instruments that we hear for the particular films and then he’ll spend the next four hours telling me exactly what those instruments can do and how they’ll fit into the film. He’ll drop all these references as far as musicians that I’ve never heard of and then he just runs with it. He’s constantly on tour, so he’ll be sending us stuff from Australia. Usually, it’s right from the beginning [of thinking about the film] and it’s almost always right on the mark. We’ll do a back and forth to place things, but it’s a very organic process, working with him. He chose certain themes for each character and the different settings and I’m very proud of what he came up with. Bill Ross: He gets it, which I think is hard to articulate. [Our] direction might dictate, ”We want it to sound like it was recorded in a 1900s church in the desert” and he’ll come up with a real practical way to execute that. It’s fascinating. I felt a strong Cormac McCarthy vibe here, particularly in terms of the way you presented the gangs as if evil was this unstoppable force. Was he an influence at all? Bill Ross: You certainly got us there. He was somebody we were reading quite a bit during the production and the edit. But we were presenting that part of the story as we experienced it. [The violence] was never truly in our face. It was always hovering around the edge, and we wanted that to play out like that in the film because the reality is the violence is not something that people deal with directly day-to-day, but you hear whispers of it, you see it in the papers and you know every once in a while they’re will be some big flare up on Mexican side in the plaza there. But for most part, it’s rumor that people talk about in the cafes. Did you actually insulate yourself from the larger national conversation about immigration while making this or did that influence you at all? Bill Ross: Our focus was much more on a timeless narrative than any sort of contemporary event. I just keep coming back to this one afternoon where I’m sitting there reading some articles on the Internet, trying to refresh my memory on people’s names and current politics in the local region. And I read this story about the conflict between the two sides. At first, it was familiar, but I didn’t recognize the names and when I dug further into it, I realized that was because it was an article from 1987. Not that it mattered that it was a present day story that we were telling — this is John Wayne confronting a changing world, a man dealing with his daughter, and [showing] divides between peoples. It’s stuff that doesn’t need to be topical, nor is it stuff we really seek address, but in era where it’s inherent, it’s hard to not let it be part of the [film] and we were [aware] of the one-dimensionality of the media coverage of that area, so we felt like there was room to tell that story. If you spent 13 months there, how did you decide how long to stay for? Bill Ross: With the three films [we’ve made], we’ve always reached a point where we look at each other and say, “I think we got it. This story has told itself and we’ve done enough capturing to tell that story.” Of course, those stories were happening before we got there and they will continue happening, but for what we were after, it had reached a natural conclusion for us [where we] made a film and could feel good about what we had done down there. “Western” will play in Los Angeles at Cinefamily on Sept. 23rd and will open on Sept. 25th in New York at the IFC Center. TIFF '15 Review: A Deserving Musician Gets the Regal Treatment in "Thru You Princess"
TIFF '15 Interview: Rufus Norris on Finding Harmony on "London Road"